The global aircraft evacuation market is experiencing a transformational shift in dynamics in the recent times owing to the stringent regulations from government for passenger safety. As per the European Transport Safety Council, close to 90% of the commercial airplane accidents are technically survivable. A rise in adoption and implementation of advanced systems for reducing fatalities in emergency landing or accidents will also enhance the industry growth. Escalating military expenditure around the world will also serve to boost the aircraft evacuation market size. Validating the increasing military expenditure, the U.S. government had allocated about USD 700 billion for defense sector in 2018. As per the statistics from the World Bank Group, the total number of air passengers reached 3.98 billion in 2017, with a growth of about 7.5% as compared to 2016. The penetration of new entrants in the aviation industry and the and robust efforts by established firms to deliver high-grade aircraft will further enhance the growth of aircraft evacuation market. Commercial Aircraft Corporation of China (COMAC) for instance, announced in February 2018, that the company will deliver its first C919 single-aisle jet by 2021. The rising number of airplane deliveries will also serve to augment the industry growth in the years to come. For example, Boeing announced in 2018 that the company would deliver about 42,730 aircrafts by 2037. The increasing number of airplane fleets will thus establish a lucrative growth opportunity for aircraft evacuation market players. The U.K. based Survival Equipment Services has recently achieved the ISO 9001:2015, an upgrade to its Quality Management Standard. The audit by Exova BM TRADA confirms the commitment and hard word by the company for meeting the upgrade to this latest standard. Meeting all the requirements for ISO 9001:2015 ensures the engagement by management with a quality management system of the organization in driving business performance. Accomplishments such as the aforementioned are anticipated to further strengthen the goodwill and trust factor of the company, which in turn will assist the firm to enhance its position in the aircraft evacuation market. A few days ago, the leading safety and survival specialist, Survitec Group, launched a new service and distribution hub in Singapore for meeting the expansive demand from consumers across the Asia Pacific region. This extensive complex in the Sembawang district of Singapore covers an area of 7,153 meter square. The Singapore distribution centre of Survitec services aviation, defense and maritime sectors of the region. 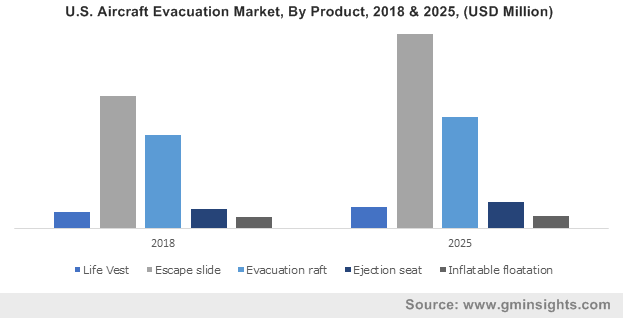 Such expansion moves in crucial markets are certain to advance the commercialization potential of the aircraft evacuation market in the years to come. In November 2018, the British manufacturer of ejection seats and safety equipment Martin-Baker produced its 2000th JPATS ejection seat. This seat was produced for the highly successful Textron T-6 Texan II trainer program, whose first flight took place in July 1998. Currently, more than 700 such aircrafts are in service with US armed forces alone, along with an additional 9 nations ranging from the UK to Iraq using this aircraft. Furthermore, the commitment of the company to support the Joint Strike Fighter recently took a leap forward when the company opened the Martin-Baker Australia Field Office at Williamtown. The competitive spectrum of this industry is quite diverse, and encompasses a number of renowned companies. Analyzing the commendable attempts undertaken by these companies to ensure the manufacturing of highly efficient products, it is overt that the aircraft evacuation market is certain to depict tremendous growth in the years ahead.